Ask any American and the answer no doubt includes a number of key words that conjure up specific images: turkey, pumpkin pie, football, the Macy’s Day Parade, sleep, being thankful, Christmas is coming, Black Friday, family, Grandma’s special spice cake, obnoxious Uncle so-and-so, etc. Probe a little further for the meaning of Thanksgiving and most Americans will say something about it being a time to step back from the crazy, chaotic lives we all live and to be thankful for our many blessings. The story we all know and claim as the history of this holiday is the story of the Pilgrims who arrived on American soil in 1620, suffered the tragedy of many deaths during their first winter in North America, and befriended the neighboring Wampanoag Indians the following spring. The Wampanoag Indians shared their knowledge of the land with the Pilgrims resulting in a great harvest the following fall. Apparently the Pilgrims invited the Wampanoag Indians to share in their harvest feast. The story stuck. It is, after all, a nice, warm story. People continued the theme of Thanksgiving coupled with sharing and feasting. 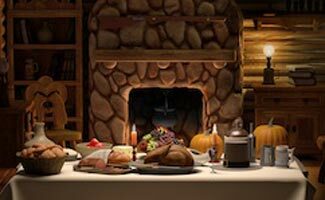 Eventually in 1862 President Abraham Lincoln claimed the 3rd Thursday in November a national holiday of Thanksgiving. This is our story, our legacy, a part of our national identity. There are many debates about the authenticity of this story. These valid arguments are worthy of discussion in another article. The point here is that this version of the American Thanksgiving story is widely accepted as our historical truth. And as such, it forms a part of our understanding of ourselves and our values. The Thanksgiving story contributes to the characteristics and traits we identify as “American”. Even if you have no blood ties to either the Pilgrims or the Wampanoag Indians, they are symbolic of our collective ancestry. In this way, we can all claim the legacy of sharing knowledge and material blessings with others and the ideas of diversity demonstrated by our ancestors. Thanksgiving is therefore, a time to share the rewards of hard work with family and friends. Thanksgiving is a time to reflect and be grateful. The idea of being consciously aware of our blessings and expressing our own gratitude to God and others for many good things in life is a legacy we carry on with vibrant enthusiasm. Sharing a meal with others is one of the most basic expressions of the Thanksgiving celebration. Being together and sharing our bounties is a universal human instinct. Most of our Thanksgiving traditions center around the theme of giving thanks. Even in these times of economic upheaval, political uncertainty, and personal challenges, we do indeed have many things to be thankful for. Many of our blessings are intangible: health, education, family, freedom, and protected human rights. This aspect of our Thanksgiving holiday stirs pride and patriotism in our hearts. After finger-picking on the left-overs and lazy napping, the sun goes down and something amazing happens: BLACK FRIDAY. Black Friday comes on the heels of Thanksgiving. An idea that sprang out of American competitive consumerism, Black Friday stuck and has now become nearly synonymous with Thanksgiving. We can no longer isolate Thanksgiving from Black Friday. In a way, they have merged into one holiday. This ironic dichotomy brings me to the question: What is the meaning of Thanksgiving? If Black Friday were on a different Friday, not the Friday immediately following Thanksgiving, we would anchor our traditional Thanksgiving on the sentiments of gratitude and humble blessings. However, because Black Friday and Thanksgiving have become so closely linked, we are caught in the grips of an inexplicable irony. How is it that we can go from a dining table dressed with the best of our family cuisines, singing our thanks for all things good, to a table that hosts a frenzy of greed? People knock over wine glasses and shove aside half-eaten pieces of pumpkin pie to grab at the various ads. Shouts of “Gimme! Gimme!” and “I want! I want!” pierce the air where the fading notes of our Thanksgiving melody still linger. Is this dichotomy the epitome of human nature? Giving and receiving and sharing with one another blend together to define our diversity, and these are all a part of the American Thanksgiving. At the same time, however, woven into the very fabric of who we are is the hot red thread of greed. This too, is a part of who we are. How do we reconcile in our psyche this irony that is the form of who we are? How do we make peace with this dichotomy in our self-identity? It’s not the sales and big turn-out at the malls that I take issue with; rather I am questioning the mob mentality that takes over before our bodies have even digested the feast. The very same people who cooked and served selflessly only a few hours earlier turn into greedy, aggressive bullies. And this isn’t just a strange phenomenon or a passing trend; it is now a part of our national identity. Is there a way to reconcile both Thanksgiving and Black Friday? As the holiday of Thanksgiving continues to evolve with the ebb and flow of our changing society, I hope we can each be consciously responsible for clarifying, at least for ourselves, what we believe is the true meaning of Thanksgiving. I remember getting a week off from school for Thanksgiving when I was small, and learning about how important it is to be thankful and at the same time giving to those in need. Decades later it seems like that message has fallen away, and now I get Holiday pay from my job at DISH for not only Thanksgiving, but also Black Friday. I feel like the new holiday is being pushed on us, and our instincts to hound out a good deal can’t help but come out when great prices are wagged in our faces. I waited all year until yesterday to get an iPad because I knew that a little patience would get me a deal I couldn’t pass up. I’ve spent all day playing with my new DISH Remote Access app and watching live TV and some of my DVR recordings on my new gadget. I can’t wait to test it on the road since I’ll be able to watch TV like I’m at home anywhere there’s Wi-Fi or mobile 3G network. If Black Friday were any other day of the year I would wait until then to get me toys. What’s up with green bean casserole?